Desperate to love yourself and live in a joy-filled body? Our never-ending striving to attain that ideal body image. It's especially true for emotional eaters- those of us who eat to feed our hungry and hangry hearts. and prove that a lack of self-love and our emotional state play an enormous role (at a biochemical level even) in all our health and weight problems. Using cutting edge research from medical and psychological journals as well as from Masaru Emoto, Candace Pert, Dr. David Hawkins and others, The Joy-Filled Body offers a revolutionary look at how our thoughts affect our health and well-being. If you think that we are merely a bunch of cells, skin, muscle and bones ... think again. There is a powerful self-love component to our health and well-being that we have overlooked. The Joy-Filled body reveals pretty amazing ideas that will change your thinking about the ideal body image forever. I was over the moon when SARK, the fabulous author of 'Succulent Wild Women'(and how ever many other best selling books) read The Joy-Filled Body and e.mailed me that she "looooooved it!," and wrote: "Living in a Joy-Filled Body is such a delicious mission! After all, what are our bodies but marvellous containers for our joy-flled hearts?" especially repeat yo-yo dieters and especially if you've been dieting to attain health and wellness. Do you want to be able to eat with joy instead of guilt? Would you like to fall in like with yourself? Would you like to have self love and better health? •	there are multiple industries making BIG bucks out of keeping you feeling insecure. Feeling insecure damages not only your inner beauty but also your health! •	the diet industry certainly won't give you permission to love yourself. Your self-criticism if their lifeblood. Living in a state of harsh self-judgment is devastating to your health. •	all your repeated dieting attempts have drained you of self-love and self-confidence. Repeated dieting damages your body and does nothing to help you feel the way you'd like to in your body. The Joy-Filled Body gives you the science to prove that living lighter and having more fun and more love are great health enhancers. It took me years of dieting, self-hatred and research to find the solutions to weight and negative body image problems but you'll get to share all the secrets I've learned in 'The Joy-Filled Body: Eat! Play! Love and Love! when we start remembering that we're Sacred and that our body shape and size can never change this fact, then we start to self love and heal at a level that is so much deeper than just changing our body size. We think when we change our bodies we'll find happiness. The truth is that when we remember our Sacredness we can be happy in whatever body we're in and then any weight we need to lose falls off all by itself. We've just got it all backwards. The fascinating thing about this book is that many of the secrets that will keep you turning the pages ideas contain wisdom that is way beyond any knowledge I held when I started out writing it. And frankly, I can't take the credit because how the writing of this book unfolded in itself was pretty astounding as you'll see when you read it. Imagine having Oprah, The Dalai Lama, Wyne Dyer, Leonardo Buscaglia and Nelson Mandela- help you write a book! You can't go wrong with a team like that! As South African Health Journalist Elize Parker says: This is revolutionary and gripping reading. 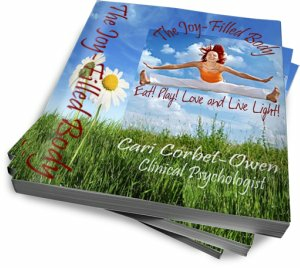 You are a gifted author and should not stop with this beautiful and insighftul book: Please Cari, we need authors in the world of self-help with soul like yours! The incredible research that forms the backbone of this book, wasn't information I went out looking for - it all found its way to me sometimes in rather mysterious ways. MY LIFE AND HOW I TREAT MYSELF CHANGED RADICALLY AS A RESULT OF WRITING THIS BOOK. THAT'S HOW I KNOW THAT READING IT CAN CHANGE YOURS TOO. I now know with 100% certainty, that self-love, self-kindness and self-compassion are powerful healers and that self-hatred, self-disparagment and harsh self-criticism are eroders of your health. The Joy-Filled Body gives the science and research behind why a diet of self-love is the only diet you'll ever need again!And it's practical - it gives you the tools to implement this self-love diet. Soon you'll be eating with love, exercising with love and before you know it, you'll be living a joy filled life in a joy-filled body! *have an incredible body with an inbuilt Sacred Biological Order that knows how to self-regulate. *are all worthy and fabulous no matter what. What really counts is not the size of your tummy, breasts or thighs, but the size of your heart and the depth of your spirit. The Joy-Filled Body is currently unavailable - please leave your details below to know when it's available again.